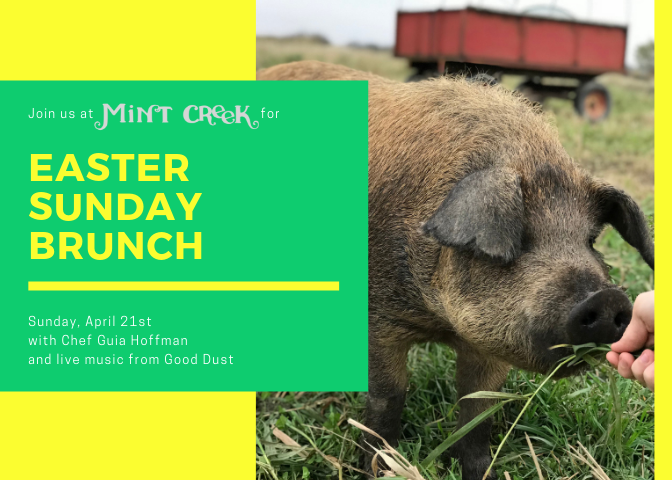 11am-1pm–Farm-to-table brunch featuring Chef Guia Hoffman with musical entertainment from Good Dust. 1:15pm: Gather on the trolley and head to Mint Creek Farm for a first-hand, interactive tour of our farm, where you’ll get out amongst the animals and learn all the ins and outs of the place from head farmer Harry Carr. *We recommend wearing shoes you don’t mind getting dirty. 3:30-4pm: The trolley will return guests to the Greenhouse Bed and Breakfast as the event concludes.